The Components, when combined, are showing us our modus operandi – it gives us clues why we behave the way we do, what are our general goals and aspirations, and whether we have what it takes to achieve them. Character Components are extensions, or a toolset, of Master Element (ME), can be divided into three groups. INTELLECT and BODY belong to the Support group. INTELLECT provides learning abilities and acts as a support while the BODY provides physical strength and networking abilities to Master Element. WEALTH and POWER belong to Goal group; they represent ME’s aspirations. Essentially, all humans are striving towards these two Components. Either we want to have enough money to live comfortably, be financially independent and provide for our families (WEALTH), or we want to have a position in society so that we can introduce our ideas and initiate change (POWER). If both of these goals are unattainable, the person will have difficulties achieving success and will have to rely on others for basic living needs, regardless of how educated or talented they are. OUTPUT Component represents a Creative Process, and it acts as a glue between the Support and Goal group. The OUTPUT is essential because it gives us the ability to present our skills and ideas. Without OUTPUT, it’s quite hard to make that bridge towards WEALTH and POWER. That being said, in some cases, it is possible for the person to achieve their goals without OUTPUT, but will generally have a harder path. 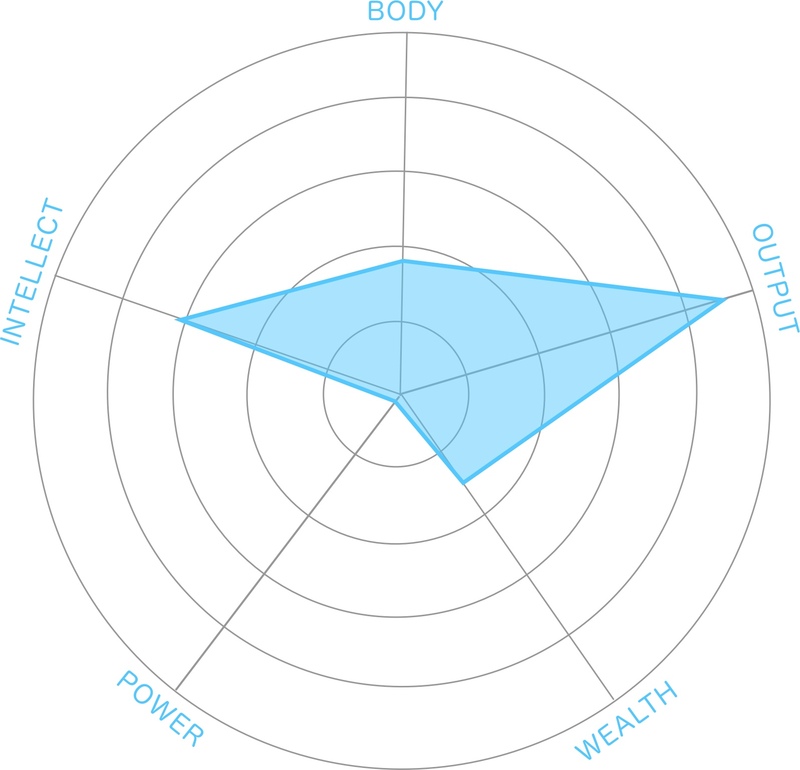 Below is a visualisation of the general dynamic between Components, with ME using INTELLECT and BODY Components to obtain WEALTH and POWER, using OUTPUT. The dynamic between these Components is explained further in our Talent Bridge section.